Today is a very special day as it is Addicted to Stamps and More's 2nd Birthday! Thanks to our very lovely leader Kylie and all you wonderful supporters, this challenge had grown and grown over the last 2 years. I have used a sun ray stamp to create the colour wheel and covered it in glossy accents-hard to see the shine from the photo but IRL it really is glossy. This took ages to dry but once it was the rest of the card just came together really quickly. For our Birthday we are being sponsored by Stitchy Bear Stamps who are offering our winner 3 images up to $10 from their store. And as usual you can check out the inspiration from out DT HERE and then we sure hope you join in our Birthday celebration. I am at the moment on my way to the airport for a 2 week holiday so although I have some DT cards pre-scheduled I won't be around much in blogland until I come home...all tanned and relaxed!! Love it! Perfectly clean and simple, a perfect take on the photo! Have a wonderful holiday...this card is fabulous. Love the rainbow of colors! I love this card! It's such a beautiful design and the splash of color is perfect! A beautiful card! The scored lines are so well placed; it is all that was needed to drow the attention to the wheel; so clever! What an AWESOME take Sandie!!! Oh, this is so cool & fun! Wonderful take on the sketch! WTG, combining the inspiration photo and sketch, Sandie! I love your rainbow of colors on your Rosette with your CAS design, and how great it pops against your background...so pretty! This looks awesome - truly clean and simple!! What a phenomenal job!! Such a cool card! Great CAS card! 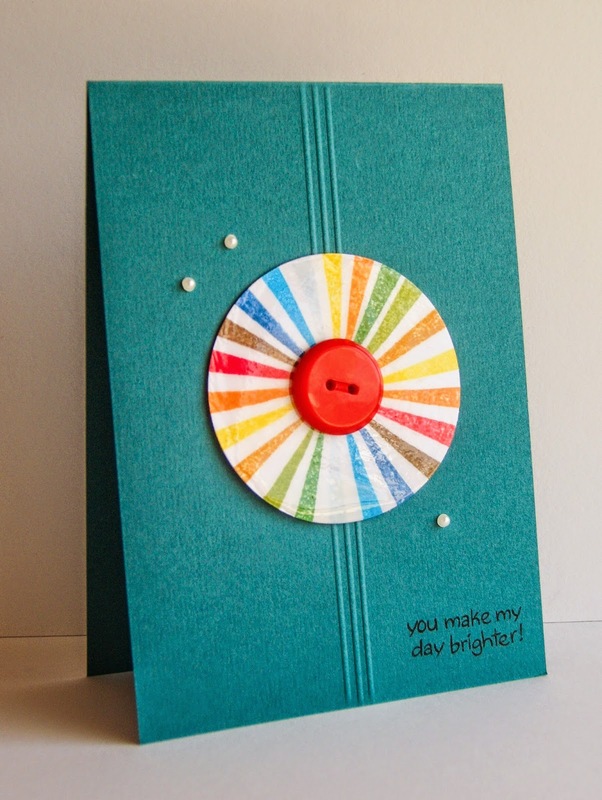 Wow...what a fun card and I love your brightly colored circle with that vivid button, just so perfect! 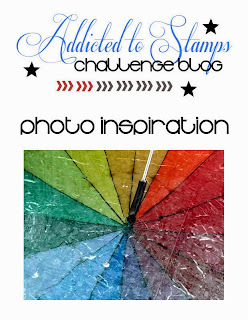 The blue card base was a brilliant idea with that focal rainbow color piece :) I love ur card !